Recent Events in the have resulted in a worldwide economic slowdown. In response, the Midwest Speed Quest of Worthington Minnesota has announced a 3 Phase "Economic Stimulus Program". PHASE ONE: $200 CASH for the first Windsurfer who records a "Best Ten Second Interval" of 30 knots (34.5 mph). If two or more windsurfers recorded this speed on a single day, these funds were to be shared. Today three racers showed up, so It was decided that any racer who broke 30 knots on May 31 would be awarded $200. David Knight of Fridley Minnesota recorded a 31.74 knot run. 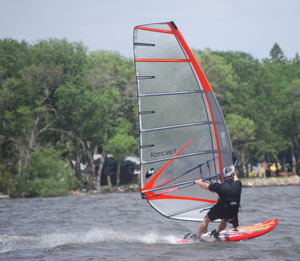 He was sailing a Carbon Art SL 62 Slalom Board, a KA Koncept 5.8 Sail, and a Vector Rockit 34 cm fin. Chris Lock of Plainview Minnesota recorded a 30.14 knot run. He was sailing a Starboard Carve 111 Board, a KA Koncept 6.6 Sail, and a Vector Canefire 38 cm fin. Below are photos of Dave and Chris accepting their Prize Money. This is not the money you could be saving on car insurance. This is the money you could be winning at the Midwest Speed Quest! Also pictured is Ed Melechson of Omaha Nebraska. He recorded a 29.331 knot run. Although he did not win $200; he did record a number of personal best speeds including a 30.114 knot Two Second Run. Ed will be back later this year for another session. 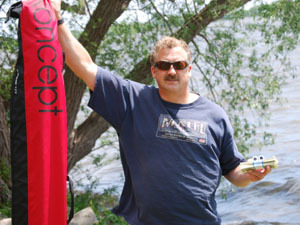 Ed was sailing a HiFly Free Ride Board and a KA Koncept 5.8 Sail. 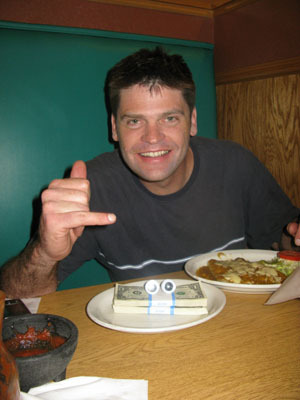 PHASE TWO: $500 CASH for the first Windsurfer who records a "Best Ten Second Interval" of 35 knots (40.25 mph). PHASE TWO starts June 9, 2009. PHASE THREE: TO BE ANNOUNCED!!! The Midwest Speed Quest runs on an open Schedule from April 15th to October 15th, 2009. You decide when you want to race. This event is entirely free, and even the GT31 GPS units are provided! Please let us know one day in advance if you plan on attending.